Throughout Psychology: An Exploration , 4th Edition, Saundra Ciccarelli and J. Noland White employ a learner-centered, assessment-driven approach that maximizes student engagement, and helps educators keep students on track. In this brief text, the authors draw students into the discipline by showing how psychology relates to their own lives. Clear learning objectives, based on the recommended APA undergraduate learning outcomes, guide students through the material. And assessment tied to these learning objectives lets students check their understanding, while allowing instructors to monitor class progress and intervene when necessary to bolster student performance. Available to package with Psychology: An Exploration, 4th Edition, MyLab™ Psychology is an online homework, tutorial, and assessment program designed to work with this text to engage students and improve results. MyLab Psychology is ideal for courses requiring robust assessments. Psychology: An Exploration, 4th Edition is also available via Revel™, an interactive digital learning environment that replaces the print textbook, enabling students to read, practice, and study in one continuous experience. Revel is ideal for courses where student engagement and mobile access are important. Saundra K. Ciccarelli is a professor emeritus of psychology at Gulf Coast State College in Panama City, Florida. She received her Ph.D. in developmental psychology from George Peabody College of Vanderbilt University, Nashville, Tennessee. She is a member of the Association for Psychological Science. Originally interested in a career as a researcher in the development of language and intelligence in developmentally delayed children and adolescents, Dr. Ciccarelli had publications in the American Journal of Mental Deficiency while still at Peabody. However, she discovered a love of teaching early in her career. This led her to the position at Gulf Coast State College, where she taught Introductory Psychology and Human Development for more than 30 years. Her students loved her enthusiasm for the field of psychology and the many anecdotes and examples she used to bring psychology to life for them. 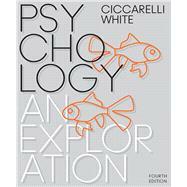 Before writing this text, Dr. Ciccarelli authored numerous ancillary materials for several introductory psychology and human development texts. J. Noland White is a professor of psychology at Georgia College & State University (Georgia College), Georgia’s Public Liberal Arts University, located in Milledgeville. He received his A.A. in psychology from Macon State College and both his B.S. and M.S. in psychology from Georgia College. After receiving his Ph.D. in counseling psychology from the University of Tennessee, he joined the faculty of Georgia College in 2001. He was a recipient of the Georgia College Excellence in Teaching Award in 2008. Dr. White currently teaches Introductory Psychology, Psychology of Adjustment, Behavioral Neuroscience, Advanced Behavioral Neuroscience, Counseling and Clinical Psychology, Senior Seminar, and a section of Advanced Research Methods focusing on psychophysiology. He has an active lab and, with his students, is investigating the psychophysiological characteristics and neuropsychological performance of adults with and without ADHD. Outside of the lab, Dr. White is engaged in a variety of activities centered around the use and development of effective assessment strategies in individual psychology courses, and in developing effective strategies for departments or programs in psychology overall. Dr. White is also a licensed psychologist and has worked primarily with adolescents and adults, in a variety of clinical and community settings.